another of my favorite games is scud race so here I started to play around with the new "Scud Race + + Patch and Hacks" as we all know supermodel emulator does not support replacement textures (hopefully in the next version count with replacement textures ) ... but at least I managed to change the skins of the leading cars. nice! i love scud race. Although I think the only one that got improved was the viper in blue/orange. maybe im just too used to seeing them in their original colors. keep up the hacks! What is the chances of lamp outputs on version 0.2? Just wanted to add "happy customer" here, this is a great mod, got a chance to try it out last night and it's a lot of fun and does bring some new life to it. The new pics of the future updated version look great too, a nice bump in texture quality from the first version. If you were wondering if anyone's appreciating your work, I certainly am!!! I'm new to the entire model 2 and supermodel emulators and I have to say the authors of these have done a great job too! I must agree, this is some very amazing work; I can't imagine how much time has been devoted to this project! If I can ask, is there a way to increase the volume of the background music during a race (or decrease the volume of the sound effects) via a lua script or some other method? When I play the game in my twin cab, the roar of the engine is so overpowering that it's difficult to hear the classic Daytona race music. Is there a way to increase the force feedback? I think it feels pretty weak? Has nothing to do with this patch. See the Model 2 setup guide thread stickied at the top of this forum. I also recall people sharing their settings in a thread. Use the search function to find it. Any news on patch 1.2? 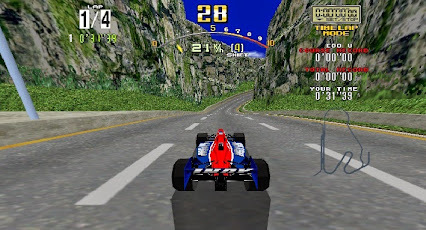 I'm really interested in a setting up a pc specifically for this Daytona USA emulation, but what are generally the absolute recommended computer specs? I don't want to shell out the cash for something that is more powerful than what this game needs and I don't mind having to track down older cpus/motherboards, ect. Any Core2 at 2GHz is fast enough CPU wise. Firstly - kudos to Nuexzz to creating this. It's been a dream for me to play these games since I first saw them at the arcades and to have the ability to play them at home is just awesome. This isn't new, but somebody else has done something similar with Sega Rally using Model 2 Emu. Looking forward to the next patch Nuexzz, that WIP screenshot looks great. if it's an excellent job, unfortunately I do not like Sega Rally is a shortening. and a bit off topic now I have a little time (not much) to Continue with patch. 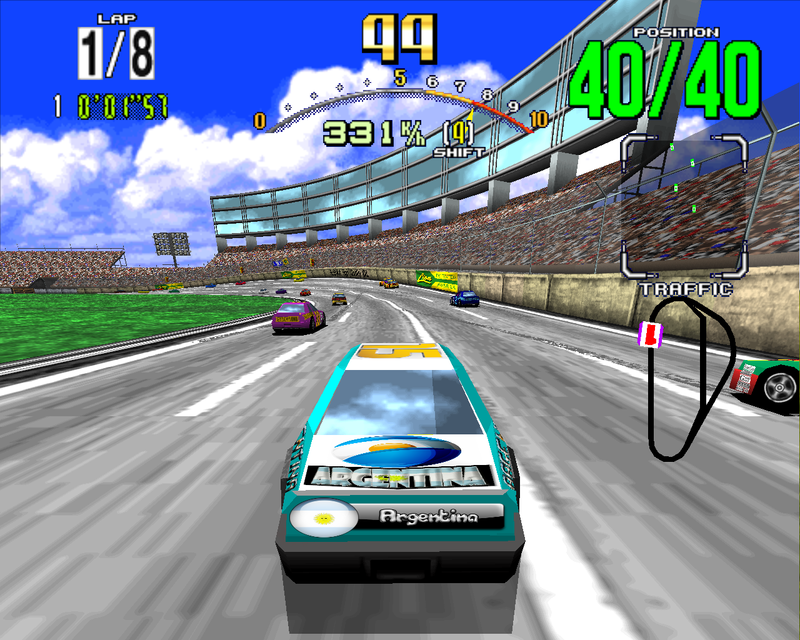 Realy love this daytona usa ++...just a little camera glitch on the hood of no standard cars! ...because the forum is down! THX a lot and good luck for you excellent work! Hi SEGA4ever thanks, I can not remember where I have the shaders I played in his time ..but this has to eliminate some graphics bugs. THANK YOU very much my friend,love you! They actually have a safety car in Daytona 1? That surprisingly might be possible. The lua scripts can launch external exes, so aside from finding the memory addresses for the music, all one would need is a command-line controlled mp3 player. It would be awesome to be able to eliminate the music and keep the sound effects. I remember a while Nuezxx made some sort of cheat that attempted to accomplish this task but it didn't work correctly. Well if I ever get back to my racing cab I'll look into it. Outrun Radio is essentially going to do this (as an option) for 2k6. LOVE THIS! It runs really well on my machine. One thing I would personally like to see is a 'Loading Textures' or something to that effect when the screen goes black. Those of us that have gotten this far understand that the black screen is when the HD textures load but it would be cool for when guests come over and fire it up. Useful for getting to start from hyperspin/etc. I signed up today to congratulate the Nuexzz !!! I'm a fan of Daytona USA. Please, please and please: Hope the roulette wheel and Sonic will be back!!! Thank you very much for this patch. Really amazing work. I've encountered some issues when using npc cars. At times, the HUD will partially disappear. And I've noticed the game will crash to a white or blue screen at the first checkpoint of Dinosaur Canyon while in Timelap Mode. Switching back to the hornet immediately solves these issues, and they don't seem to turn up in arcade mode. On another note.. If anyone is finding it difficult using analog thumbstick steering, I've had some success using Durazno as an xinput wrapper for a 360 controller. Adding a small 4% deadzone and increasing linearity to 2.50 seems to work for me, but YMMV. Also works with supermodel. so, how is the proyect going?